Reserve Or Rent a Unit Today!! Click on the “Rent Now” button below of the unit size that you would like to rent and walk through our 3 step process of renting a unit. We charge a reservation fee to reserve a unit, and will apply this towards your rent when you move in. Rent one TODAY! 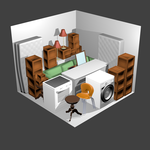 A two-bedroom apartment or house, including appliances, boxes and misc. 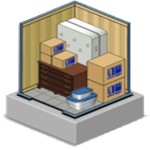 items and commercial storage inventory. A three-bedroom house with major appliances, plus misc. Business storage files and inventory ideal for storage racks. This unit has all the features of the others and also has 3 shelves 16' in length down one side of unit. This is a drive thru 10x30 with electrical receptacle in unit. The 10x30 is a "drive thru" unit with door on both sides. Alarm on both doors to notify you of access!